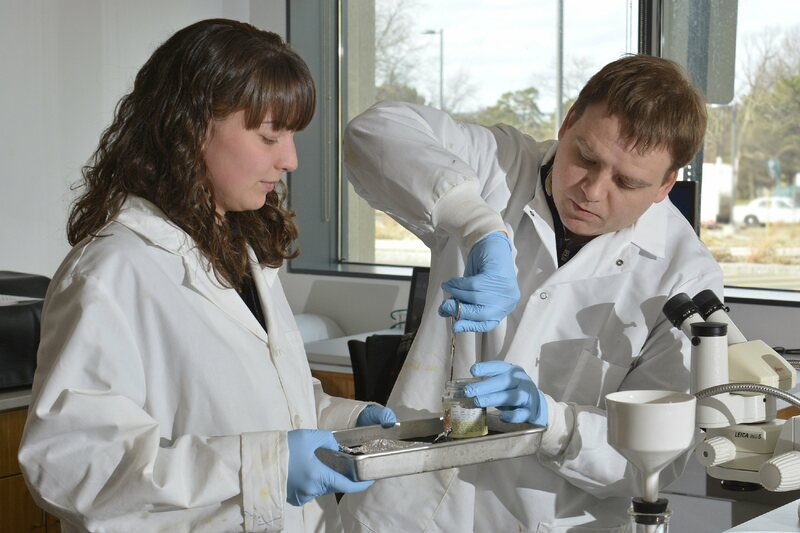 Student researchers Nina House (left) and Scott Minihkeim, both SUNY Oswego biology majors, demonstrate a step in their examination of Lake Ontario fish stomachs for evidence of microplastics deposited in the water from clothing and cosmetics. They will present results at Quest and later will inform a wide range of experts at a research conference on the Great Lakes. OSWEGO — SUNY Oswego’s Quest 2017, a daylong symposium on April 5, to celebrate scholarly and creative activities on campus, promises a rich array of faculty-mentored student presentations, demonstrations, debates, exhibitions and panel discussions. Quest is free and open to the public. Parking is available in lots off Centennial Boulevard adjacent to Marano Campus Center and across from Shineman Center. A detailed schedule will be available prior to April 5 at oswego.edu/quest. Biology majors Nina House and Scott Minihkeim will present findings that promise to help quantify the threat of microplastics making their way into Lake Ontario. Their examination of 330 stomachs of forage fish — round goby, deepwater sculpin and alewife — found evidence of the tiny fibers and pellets in all but nine specimens. The students’ mentor, C. Eric Hellquist of the biological sciences faculty, said experts who have seen House’s and Minihkeim’s work have lauded its quality. They are finishing a paper co-authored by Hellquist and Maureen Walsh, formerly of the U.S. Geological Survey in Oswego, who supplied fish samples from around the lake. The project’s abstract has been accepted for presentation at the May meeting of the International Association of Great Lakes Researchers in Detroit. 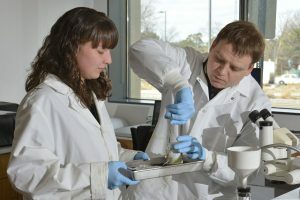 House and Minihkeim have done exacting work extracting and dissolving the fish stomachs, filtering for microplastics — which enter the water from such waste as fibers from fleece jackets and beads from cosmetic products — and literally counting the tiny pieces of evidence. The daily life of Nepali at a private monastery is challenging, yet they find happiness in all they do, said SUNY Oswego graduate student Danielle Carr (left). Making rice noodles (from left) are Guru’s wife; a young monk-in-training named Mahendra; Pendi, Guru’s daughter, who is a Buddhist nun in training; and another monk in training. Danielle Carr, a graduate student in SUNY Oswego’s mental health counseling program who also teaches seventh grade social studies in Carthage, aims to present at Quest how her observations of Nepalese monks’ mindfulness have augmented her coursework and clinical experience with Western techniques. Her campus mentor, Terrance O’Brien of the counseling and psychological services faculty, said mindfulness is important to clinicians working with veterans and other clients, because it stills the anxious, fearful mind. “She’s going to teach my class, incorporating what she learned in Nepal,” O’Brien said. Another member of the debate team, Jackson Berner, also made the “I like to argue” argument. A 40-year-veteran debate coach, Downs said students need to be prepared to argue both pro and con. There will be a debate rematch at Brockport. “If you are constantly screaming your opinions into an echo chamber, your arguments are never going to get any better,” he said.